We have something completely different to offer you right now. It's made in America, but with an interesting Russian connection. 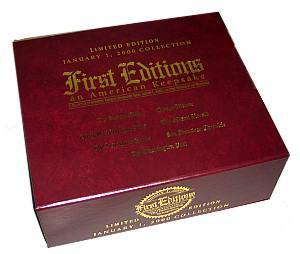 The "First Editions: an American Keepsake" is a collection of seven major American newspapers that date to 1 January 2000. 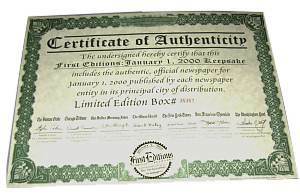 The newspapers are uniquely packaged in a handsome burgundy box with gold foil lettering made especially for this collector's item. The set includes complete, original editions of the Boston Globe, the Chicago Tribune, the Dallas Morning News, the Miami Herald, the New York Times, the San Francisco Chronicle, and the Washington Post. It provides a unique coast-to-coast perspective on the millenium celebrations and other events in the USA and abroad. A numbered certificate of authenticity is included, as well. Besides the millenium celebration, though, how many remember that a major political event took place then, too, perhaps with lasting significance. The event was the abrupt and shocking resignation of Boris Yelstin and the ascent to power of Vladmir Putin. Since that time Putin has become a strong leader for that country, enjoying considerable popularity in Russia, and proving skillful in dealing with foreign relations as well. Just recently, under his leadership Russia has become a junior partner of NATO. In light of the events of his presidency, it seems possible that Putin will be the first great Russian leader following the fall of the USSR, and his historical significance could be extremely important. Accordingly, the "First Editions" collectible, which features coverage of Yeltsin's resignation and Putin's installation as President, is of special interest to anyone with an interest in world politics or Russian affairs, by providing a record of the historic change of leadership on 31 January 1999. 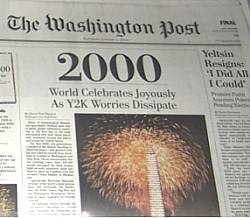 In addition to this major Russian event, another interesting feature of the newspapers here is the way in which they captured an optimistic mood of America at the turn of the millenium, a mood which has dramatically changed since 11 September 2001. On 1 January 2000, it became apparent that fears of "millenium bug" disasters were unfounded and that the world had safely survived the change of the calendar. The seven newspapers chronicled a spirit of hope - the feeling that we are embarking on a new era, where the possibility of progress is almost endless. The Miami Herald, for example, recorded how "billions rejoice as era begins with few glitches, while the Chicago Tribune looked forward to the dawn of a new era on a cover essay talking about "the human spirit at a threshold." There are accounts of New Year's celebrations going on with abandon--a marked contrast with the pessimism and fears of terrorism which unfortunately prevail today. The millenium celebrations provide an excellent point of comparison with the post-9/11 Zeitgeist, making the "First Editions" collectible an interesting historical record. The "First Editions" set would be an excellent addition to your own library, particularly for someone who is a history buff or for someone who enjoys following world events. Because of the events in change in leadership in Russia, it may be the most significant turn of the century to have ever taken place. Whether the set becomes a valuable collectors item in the years to come, it is hard to say. We will admit that we bought these sets at what we believe is an embarrassingly low and unjustified price. In our opinion, this item has solid intrinsic value and is something that will be handed down for future generations. Reportedly, these sets were originally sold for $99 on the QVC network . But because of our good fortune in being the right place at the right time to grab some of these at closeout prices, we can pass much of the incredible savings on to you and offer them for just $29.95 plus our normal $5 shipping charge. And if you buy more than one, there is no additional shipping charge with our flat rate shipping. Search results: Page 1 of 1 total page with 1 results.